Eden Springs have agreed to supply handy bottled water to Macmillan Cancer Support’s 2012 Challenge Event participants in a major step in their UK-wide charity water initiative. By providing water at events for our supporters Eden Springs is helping to make sure that the Team Macmillan experience is second to none in Challenge Events. Macmillan fundraisers will be tackling events ranging from the London Marathon to the Great North Swim, with fantastic running, hiking, swimming and cycling events taking across the UK in locations as diverse as Brighton, Manchester, Leeds, Edinburgh and even Loch Ness. 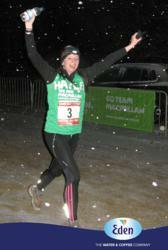 For more details on what events are on offer visit macmillan.org.uk/events. Eden Springs are the UK’s leading water cooler rental company, and in addition to providing Macmillan Cancer support with water for over 15 events the water provider is offering 1,000 cases of 500ml bottled water free to individual charity fundraisers who apply through the Eden Springs website. The support of the participants at these events, and the money they help to raise, makes a real difference to people living with cancer. The water donation by Eden Springs is part of the office beverage company’s ongoing commitment to charity and community causes. Eden Springs is a recognised European brand and the leading supplier of bottled and plumbed-in water coolers in the UK, offering a complete range of hot beverage solutions including machines for premium coffee, hot chocolate and tea. Based in Glasgow, they supply solely UK-sourced water and service 130,000 water coolers held by more than 80,000 customers across the country. To learn more about Eden Springs, or to view a complete range of water coolers and coffee machines, please visit EdenSprings.co.uk. Macmillan Cancer Support is a UK charity that provides practical, medical, financial and emotional support for people affected by cancer, and pushes for greater cancer care. The number of people living with cancer is growing every day, so Macmillan is committed to fundraising as much as possible to ensure we can reach everyone affected by cancer.